If you’re like us sometimes you just want to play around with your data a bit more than Google Analytics provides. Maybe you want a different type of chart or simply want to combine your data with some other source. While Google Data Studio is a super useful tool for this type of task, there can be a learning curve in order to get the exact type of data you seek. Enter the Google Analytics Add on for Google Sheets. If there’s data in your GA account you can pull it into Google Sheets with this plugin. Dates, goals, users, sessions; it’s all there for the taking. What we like to do with this plugin is to leverage this data to create better dashboards than what GA provides as the Sheets plugin allows you to schedule this data to be pulled automatically and thus you can send your team a link that they can access at any time to see fresh data in the format you wish. While the Sheets charts have a long way to go in order to be as useful as Excel, there is still plenty of visualization options at your fingertips. Take a look at Google’s documentation and tutorial to see what is possible. Then, start putting questions on a white board that your Google Analytics data can provide answers to. Once you know what you’re asking from your data you can begin to query the vast Google Analytics API easily using the Dimensions & Metrics Explorer. As you click on different dimensions or metrics others will gray out if no correlations are available. This Add on is a simple way to start seeing your data in a whole new light and providing better visual insight into new opportunities! As a myriad of items swirl around the economy these days and idea is beginning to surface in many company boardrooms. Zero Based Budgeting is essentially the review of budgeting line items to ensure viability and efficiency. There’s obviously more to it than that and you can read a great article from McKinsey about the 5th myths of zero-based budgeting to learn more. However, for our intent and purpose we want to leverage this methodology to ensure you’re thinking through your digital marketing expenditures. We’ve written a lot of about budgeting recently and the reasoning is that as we approach the end of the year it is imperative that the budgets you create for 2019 are accurate and viable. What is your goal? We ask that a lot, I know. But it is a fundamental question that often is never fully fleshed out. Zero-Based Budgeting forces organizations to think through their goals and revenue targets so that each dollar that goes out is accounted for. It all starts with the organization understanding and agreeing on specific targets, then each department is forced to be accountable to those targets. So to begin, ensure that you understand the revenue goals set by the executive leadership. Secondly, work backwards from your revenue goals (ensuring margin is calculated) by estimating conversion rates and click through rates to determine your overall cost threshold. Lastly, track to these goals by evaluating your return on ad spend on a week-to-week basis. If you’re not on target then evaluate which tactics are throwing things off course. Is it Pay Per Click Advertising? Perhaps it’s particular keywords driving up your cost? Knowing your revenue targets and budgeting to them is job number one as marketers and can ensure that you become a leading voice in the zero-based budgeting game! As any digital strategist worth their salt will tell you, we’ve been doing this for years. The ability to track costs and follow that through to conversion is the cornerstone to any digital marketing plan. More importantly, digital marketers have always had a clear understanding of the full conversion funnel and ensuring that each step along the way is tracked. This gives us a unique opportunity to become leaders within a zero-based budgeting organization and ensure the entire organization accounts for each and every dollar that goes out the door! Are you willing to buy a $10 bill for $50? Probably not. But if so please email me. Unfortunately many businesses do this transaction every single day by not understanding their true Cost Per Acquisition. It is a very simple task to undertake and ensures that your paid media strategy maintains profitability. Not long ago I was doing some analysis on an Ecommerce website in order to determine how visitors navigated through to checkout. The hardest part of this effort was pulling the all pages report out of Google Analytics and conducting some Excel wizardry to filter out just the Product Pages vs. the Product Category Pages. It was time consuming and incredibly monotonous. Another client was confident about the fact that their Photo Gallery was a top viewed page because it was constantly in the top ten on Google Analytics’ all pages report. They made the usability decision to feature this page front and center on nearly every page on the website. What they overlooked was the fact that they had hundreds of Events Pages and Business Detail Pages that were getting small numbers individually, but in aggregate were the top page types viewed on the site. Google Analytics’ Content Groupings are a way to group similar pages into buckets in order to see user behavior at a more aggregate level. In our Ecommerce example above it allowed us to group all of the Product Pages together in order to see how visitors navigated after seeing any product page. In our second example we were able to determine that the most desirable content was not Photos, but instead Events and Businesses. More information on these groups can be found here, but I find that Rule Definitions are pretty robust and fairly easy to implement. Just target pages using Include and Exclude filters the same way that you do when you create Advanced Segments. We could list several more, but it really depends on your website. Ask yourself, do you have a lot of a particular type of page (eg: maybe Blog Articles) that individually are very difficult to report on but in aggregate it would make your life easier? If you have any questions about how you might set up content gropings send us an email and lets chat about it! You have to hand it to the Europeans, they really care about their consumers. So much so that starting May 25th, 2018 the European Union (EU) is instituting the General Data Protection Regulation, or GDPR for short. There is a lot going on with this regulation (read MarTech’s handy guide about GDPR) but at its core it is about not storing personally identifiable information. Technically you shouldn’t have been doing this via Google Analytics in the first place, as it violates their TOS. Again, a severe oversimplification there, but that’s kind of the gist. Data Retention settings are under ‘Tracking Info’ in your web analytics Property. 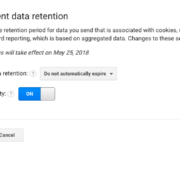 You may have seen an email in your inbox about Google Analytics’ Data Retention Policy and how you now have the ability to adjust your data retention settings. It is kind of a way for Google to ‘pass the buck’ a bit as they are now the ‘co-controller’ of users’ data along with the website owner, but in reality it is the right move because YOU should be in control of your users’ data and not Google. NOTE: Google is defaulting this to 26-months! If you’d like to change this you must login to the analytics admin for each Property, click on Tracking Info >> Data Retention Settings and adjust accordingly. You may also elect to use the “Reset on new activity” option, which is set to ‘Yes’ by default. This means that if a user re-engages with your site their counter restarts (eg: If a user comes to your site, then doesn’t come back for 25-months their information will not be on the block for deletion for ANOTHER 26-months). So, technically this only affects citizens of the EU. However, if an EU citizen visits your website you are now liable for their data protection rights under GDRP. So, you can A) Prevent EU residents from accessing your website, or B) comply with GDRP. I guess option C would be to just take the smug American ‘I don’t care’ attitude, but we don’t advocate that here. Again, since Google’s TOS are pretty clear about personally identifiable information you really should already be in compliance. What Data Does GDPR Affect in Google Analytics? But remember, this ONLY affects sites collecting personally identifiable information. So if you are collecting User ID, Client ID, or have personal data in URLs via query string (eg: /page-a?user=bob-smith) then the dire warning above is for you. If not, you’re free! (for now). What does Bluefin Strategy Advise? This advice may change down the line, so it’s always best to contact us so we can chat through your specific tracking needs before making a sweeping change to your analytics data. Not too long ago we were redesigning a website for a large hospital chain client. During the research phase of the project we reviewed the analytics to find that the ‘Locations’ page was nowhere to be found. We further dug into the numbers and saw that site searches for ‘locations’, ‘hours’, and ‘directions’ were quite high. In the qualitative research phase we talked with customer support specialists and determined that ‘locations’ type questions get asked a lot. Needless to say, when we created the user experience there was a ‘Locations’ link front and center! This is often a tough one to overcome, especially in a large organization. Web analytics can help sway opinions, but you may have to do some digging. We would not have convinced the CEOs about putting such prominence of the ‘Locations’ link had we not dug deeper into the data. UX can, and should, drive user behavior. But bad UX can drive an undesired behavior and could lead you to make incorrect design decisions. Dig into your data and don’t just settle on the quantitative side. If something doesn’t make sense go deeper and collect more data sets. A developer once told me that he approaches things like a 5-year-old… just keep asking “Why?” until you reach a point where an answer emerges. Don’t do this! A strategy is a plan, and a failure to plan is a plan to fail. Bolting on feature sets without understanding how it fits within the larger digital strategy can be immensely harmful to user behavior. It can also wreck havoc on your analytics if it isn’t implemented properly nor tagged, as we discussed in our example. When new features are discussed they must be wireframed and discussed, determining how a real life user would actually use the feature. Oh, and obviously the big one… how will we track their behavior with this feature? Well, it’s a combination of the two. It is important to think through new features and undertand how they fit into your site’s overall architecture and user experience (The Egg). However, it is just as important to learn from past behavior by asking the right questions and letting a mature site give you UX direction (The Chicken). Google Analytics’ standard reports are really great and offer up a wealth of great information. However sometimes this can get overwhelming as you may have to go into multiple reports to get one answer. Both Custom Reports and Dashboards help you overcome this issue by allowing you to combine certain dimensions and metrics together in order to make reporting and analysis easier. Custom reporting is really useful for a multitude of reasons, but first and foremost it allows you to see reports for some dimensions that Google Analytics doesn’t report on out of the box. These could be hostname reports (eg: what domains is your GA code firing one), custom dimensions (eg: dimensions you have created in your admin), or to combine out of the box dimensions together (eg: Paid Search Keywords with Time of Day). The second way to look at Custom Reports is from the metrics side of the fence. Google Analytics has standard metrics tables and organize them in the way they want. But what if you want to see Bounce Rate first, then Transaction Revenue second, then Sessions? Custom Reports allow you to organize your columns any which way you want, as well as group your own metrics in any way. Admittedly the Google Analytics Dashboards aren’t anything to write home about. We here at Bluefin Strategy actually use the Google Analytics API to create our own reports within Google Sheets and then display things the way we want. You may also have more flexibility using Google Data Studio, although that comes with its own limitations. Never the less, if you’re looking for quick and dirty dashboards Google Analytics has you covered. The benefits are that they are easy to create, are retroactive, and you can apply both time comparisons AND advanced segments to them. The latter is the only reason we still use them at all. From a strategic standpoint use dashboards as the first line of defense. What are the four to five metrics that really matter. What metrics actually affect the conversion on your website and what are the dimensions that matter most. You want your dashboards to be actionable as if they are waving a flag saying “Hey, something is wrong over here”. Don’t clutter them up with useless data points that would not help you make a better conversion decision. If you have more than six dashboard widgets you really need to ask yourself if this is really a “dashboard” or just one big report. When you create a new view filter all of the data starts getting filtered from that day going forward. That’s all well and good, but what about all the data that was gathered before the filter went into place? Well let us introduce you to Google Analytics Advanced Segments. Without overcomplicating things, Advanced Segments allow you to segment or filter data based on a set of rules or filters. You can filter on something as simple as all traffic from Colorado or as complex as only show visitors who viewed page A, B, C but didn’t see D. When you implement the segment it applies to all the reports in Google Analytics, with a few minor exceptions, so you’re able to see how a particular segment navigates your website. Additionally, you can compare up to four segments at once, so you can compare and contrast behavior between different segments. There are tons of possibilities of data to segment. Google gives you several segment ideas out of the box, such as Demographics, Technology, Behavior, Traffic Sources, etc. I’m a little old school, so I usually build my own from scratch using “Conditions”. This basically allows you to use AND/OR statements to either Include or Exclude particular traffic. You have access to tons of dimensions and metrics on which you can segment. Additionally you can use “Sequences” to define particular paths or actions that visitors take and filter them out if they don’t follow those paths. We use segments nearly every day as they allow a retroactive filtering capability to track down issues or to find your most engaged visitors. For instance, we created franchisee advanced segments for a business that had locations all across the country. We used the City dimension and included all of the cities that each franchisee covered. Another example is a school supplies company who offers both hard copy and digital products. We created advanced segments to show us visitors who purchased hard copy vs. digital products to see how they arrived on the site and if they navigated the site differently. The opportunities for segments is endless (well, within 1,000 or so) so create them to your heart’s content and start going down the rabbit hole to discover your best visitors and optimize their website experience! Back in the day we used to get by with sending specialized user defined variables into Google Analytics. Along with Event Tracking we could really start to paint a pretty granular picture of site behavior and actions. Then came along a new player in town called Custom Variables. This guy allowed us to really take more control over our variables, such as specifying whether it was a page, session or visitor variable. While these variables were great, there were certainly some limitations, especially in the reporting aspect. However with Universal Analytics Google helped solve some of these gaps and brought us to a whole new world of tracking. What is a Custom Dimension? Say I have a news site that has multiple content sections. Within those sections I have several different articles. It would be really beneficial to know what site visitors are consuming most of, is it Sports or is it Entertainment? We could create a Custom Dimension for “Section” and fire a ‘hit-level’ custom dimension on each and every page. What about your users? Say I have a log in section where in my CRM I have information about the user, perhaps a “Home Owner” vs. a “Renter”. In this case maybe a fire a a ‘user-level’ custom dimension upon login and therefore I can segment site traffic between those different segments. Google spells out all of the gritty details about custom dimensions here. What is a Custom Metric? Without getting too in the weeds (Google explains custom metrics in confusing detail here) I want to paint a few pictures of how you might use a custom metric in the real world. First off a metric is always an integer that can be counted. Whereas a custom dimension is text, custom metrics allow you to start tabulating values. One example might be a real estate site. They could send the home “Asking Price” as a ‘hit-level’ custom dimension and then be able to tabulate the average price of a viewed home (eg: “Asking Price” / “Pageviews”). Or maybe you have a live chat feature and you want to measure the pages where visitors are having to engage with chat more often. You could send a “Live Chat” custom metric at the ‘hit-level’ and be able to view the pages generating the mot live chat engagement. Or better yet, do a calculated metric based on “Pageviews” / “Live Chat” to see the percentage of page viewers who had to engage with chat. Perhaps there’s something on that page requiring attention. How to set up Custom Dimensions & Metrics? In the Google Analytics Admin you will want to pop on over to the Property Admin settings and scroll down to “Custom Definitions”. After you click there you have the option to set up both Custom Dimensions and Custom Metrics. Remember to set your strategy first so that you are confident in the scope to use. We like to use a quick spreadsheet that outlines all of our custom definitions along with their scope and a detailed note outlining where/why they are being set. The examples for custom dimensions and custom metrics go on and on, but our goal here was to provide some strategic guidance into how you might want to set them up. If you’re getting stuck or have any questions feel free to reach out to us!